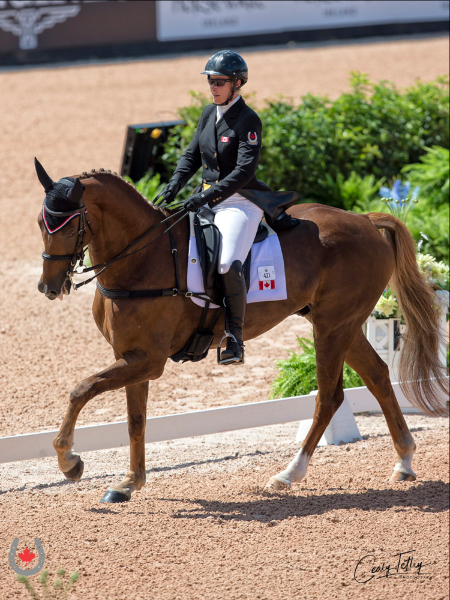 Mill Spring, NC – The Canadian Eventing Team is currently holding 15th place after two of four members completed the dressage phase at the FEI World Equestrian Games™ Tryon 2018 (WEG) in Mill Spring, NC on Sept. 13, 2018. Team members, Lisa Marie Fergusson of Langley, BC and Colleen Loach of Dunham, QC took to the Tryon Stadium on day one, putting a provisional team score of 74.60 on the board for Canada. 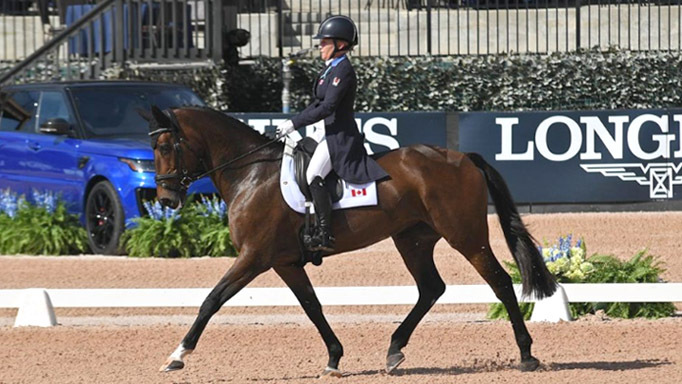 Selena O’Hanlon of Kingston, ON and Jessica Phoenix of Cannington, ON will close out the dressage phase on Sept. 14. Belgium is currently leading on a score of 32.60, with Germany in second on 50.10, and Australia in third (58.40). Julia Krajewski of Germany tops the individual standings with 19.90 aboard Chipmunk FRH. Canada was also represented by individual competitor, Hawley Bennett-Awad of Aldergrove, BC, who is currently the highest-placed Canuck in the individual standings. 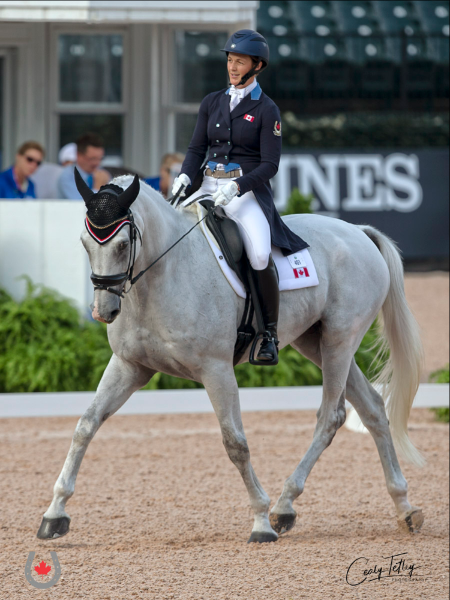 While Bennett-Awad, 41, is a two-time Olympian and a veteran of WEG 2010 and 2014, the 2018 edition represents the first-ever international championship for her mount, Jollybo (Jumbo x Danzig Connection), a 14-year-old British Sport Horse mare she co-owns with the Jollybo Syndicate LLC. Together, the pair is on a score of 32.70 penalty points for a provisional placing of 22nd. Loach, 35, drew first in the starting order, getting the competition underway aboard Peter Barry’s 14-year-old Selle Français gelding, Qorry Blue d’Argouges (sired by Mr. Blue). Together they contributed a score of 34.40 penalties to the team total and earned a provisional individual placing of 25th. Fergusson, 36, followed Loach in the starting order with her 12-year-old Welsh Sport Horse gelding, Honor Me, sired by Brynarian Brenin. In their first major games appearance, the duo proved up to the task by finishing their test on a score of 40.20 to place 39th individually. Fergusson and Loach’s combined total of 74.60 puts the Canadian Eventing Team in 15th place heading into day two of the dressage phase. The second half of eventing entries will enter the ring on Sept. 14, including Canadian veterans, O’Hanlon and Phoenix, who interestingly will both be riding their WEG 2014 partners. Phoenix will ride Pavarotti (Pavarotti van de Helle x Foxiland), a 16-year-old Westphalian gelding, while O’Hanlon will be aboard Foxwood High, a 15-year-old Canadian Sport Horse sired by Rio Bronco W and owned by John and Judy Rumble.